Meeting Jack Ma, you might be forgiven for thinking he's still an English teacher. The Chinese Internet entrepreneur is soft-spoken and elflike  and he speaks really good English. 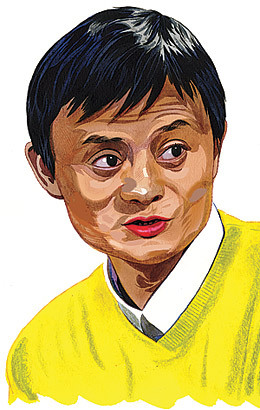 But as founder and CEO of Alibaba.com, Ma, 44, runs one of the world's biggest B2B online marketplaces, an eBay for companies doing international trade. Alibaba and Ma's consumer-auction website, Taobao.com, did so well that in 2006, eBay shut down its own site in China. A quick search on Alibaba suggests business is brisk: "require a used water bottling plant"..."we need 10000 pieces pencil sharpener"..."i like to buy superman spray." This is the lifeblood of a site that claims 8 million users and saw revenues grow last year 39%, to $440 million. Ma says he handled early difficulties by being flexible. "There were three reasons why we survived," he once said. "We had no money, we had no technology, and we had no plan." Now Ma is rich in all three.